Before you express your outrage, hear me out. I'm an animal lover. I grew up in a house that always had several animals. When I was in 5th grade, we had 3 dogs, 2 cats, 1 bird, and 1 rat. My family has had several dogs, cats, several birds, guinea pigs, gerbils, turtles, and fish. And I'm not so great around dead animals - although I can get the task done when nobody else is available. But what I don't understand is... WHAT is the fuss about eating dogs? Sure they're super cute, but they're animals just like the other ones we eat: cows, pigs, lambs, chickens... etc. When I see pictures of the dogs in cages awaiting slaughter - I DO feel sad for them... but I also feel sad for the cows, pigs, lambs, and chickens. I still eat them. They're delicious. Why should dogs get special treatment? Isn't the cow cute, too?! 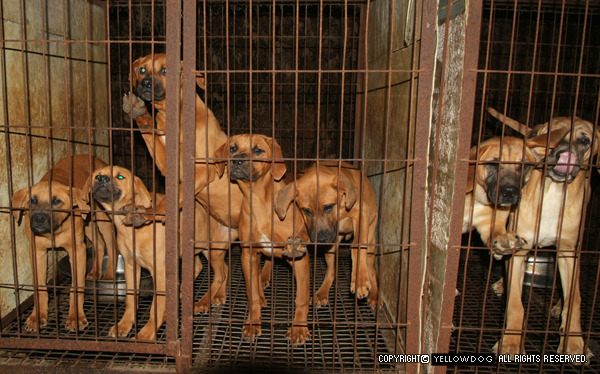 In Korea, dog meat is eaten almost exclusively in the famous stew. It's occasionally roasted. The stew is a traditional dish eaten especially at certain times of the year, during the hottest period of summer, called "Sambok". This period contains 3 "hottest" days that change each year by following the lunar calendar. There's Chobok (beginning), Jungbok (middle), and Malbok (last). The consumption of Korean Dog Stew is dated back at least to the 4th century A.D.! Many Korean foods are traditionally said to have special properties to improve your health. Boshintang (Dog Stew) literally means "invigorating stew". It is said to increase a man's sexual potency, but it is most famous for having medicinal properties and for helping to cool you down during the hot season. Q: Why would hot stew help you and cool you down in the summer? 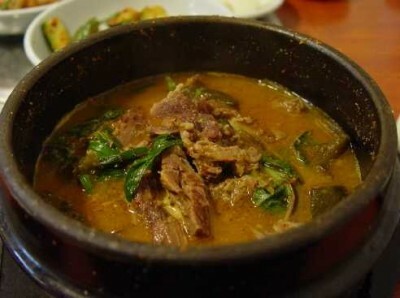 There are a few famous hot stews in Korea that are especially known for their nutrition. In the summer when people are hot and exhausted, eating these stews is actually just very healthy, providing the right nutrients to get you through a particularly hard day. Eating hot stew will cool you down in the summer. This is based on teachings from oriental medicine called E-Yul-Chee-Yul. When you fill the inside of your body with something hot, the air around you feels cooler. They also have the opposite, E-Hahn-Chee-Hahn. Eating cool things in the winter will warm you up. Do Korean People LOVE Dog Stew?! From what I've experienced, Dog Stew is neither popular nor unpopular, in Korea. I've asked a great number of Korean people if they like it and if they've tried it. Most have never tried it. Of the ones who have tried it, many didn't like it. It seems to be most popular among older men, and finding a Boshintang restaurant is not super easy. I've taken straw polls among adult students, coworkers, friends, and elementary school students. If there is a fight to be made about eating dogs in Korea... the only grounds for such a fight would be to improve the conditions under which these animals are farmed. Eating dog CERTAINLY isn't the most horrific thing I have experienced, in Korea. I once went to a work dinner at a seafood restaurant. Those who know me know I really can't eat seafood... but I went with my boss and coworkers and was told there would be other things for me to eat. We sat down on the floor around a table with a big grill in the middle with a big bowl on top. Inside there were lots of vegetables and green leaves and cabbage. They fired up the grill. Then, the man went outside and grabbed a large squid from the water tank. He brought it in and dropped it in the bowl, alive. The tenticles began searching for things to wrap themselves around. The man then began mixing the bowl and putting the vegetables on the squid's head - tentacles still moving around a lot. Then, using tongs, he grabbed the tentacles and snipped them off using scissors... and he added water. After a while, of course the squid died, and the stew was ready to be eaten. Now, I happen to like cephalopods. They're intelligent, and I think they're a little cute and interesting. For me, this was a grotesque and horrific sight that completely ruined my appetite for even non-seafood. 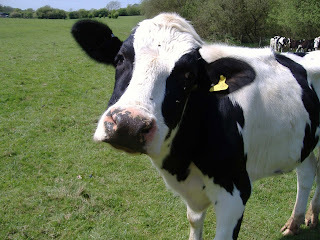 That cow is really cute!!! And let's go eat boshitang! In Korea: "You're Too Fat"
Before Psy: Yangban Style! WALK KOREAN! North Korea: How Can South Koreans Cope?